Middlesbrough head coach Aitor Karanka says his side are doing well to handle the pressure of their promotion charge. Top of the Championship, Karanka's side have four games left to play and have a two-point cushion over second-placed Burnley, who they face on Tuesday. "I think we will have less pressure than Burnley because they need to win," Karanka told BBC Tees. "It's tough for the players in these games when everyone is excited and expecting promotion." He continued: "It's difficult to manage the situation but they are handling it really well. We know we are arriving in this game in a good position against Burnley, who were in the Premier League last season with the same players." After a poor run of games which coincided with Karanka failing to take training and missing their 2-0 defeat by Charlton, Middlesbrough have improved their form with six consecutive victories putting them top of the league. "It's impossible to know what will happen in two or three weeks. I have been here for two years and I have learned this league can change in just two days," Karanka added. 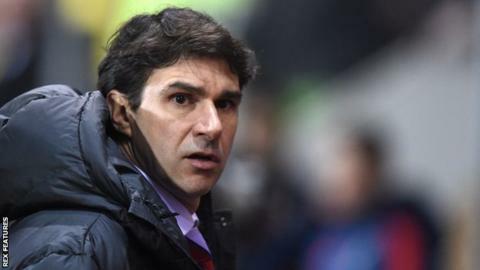 Middlesbrough's George Friend and Daniel Ayala were named in the Football Manager Team of the Season at Sunday's Football League Awards, but Karanka has heaped the praise on the unity of his squad and says many players contributed to Boro's success. "I can't forget players like Tomas Kalas but he's on the bench because Daniel Ayala is playing really well," said the Spaniard. "It is the spirit of the team to play together."